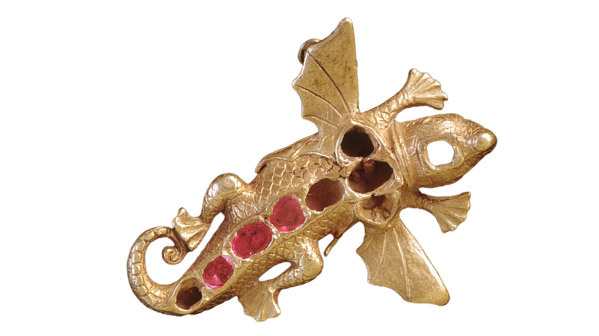 This incongruously elegant jewelled pendant was recovered from the wreck site of the Spanish galleass La Girona, which sank off Lacada Point, on the north Antrim coast, in the autumn of 1588. Girona was part of the largest invasion fleet yet assembled, the great armada of 130 ships that set sail from Lisbon on 30 May 1588. Its aim, as part of Philip II’s crusade against Protestant ‘heretics’, was to depose Elizabeth I and presumably to reestablish a Catholic monarchy. (Philip had been married to Elizabeth’s sister and predecessor, Mary.) Spain and England were already fighting a proxy war in the Low Countries; Philip was now intent on a comprehensive victory. On board the ships was a vast store of ordnance, including the massive siege guns intended to batter down the walls of London. The pendant embodies the imperial power and commercial reach of Spain. Its body is of gold probably from the Spanish colonies in the new world of America. The rubies that marked out its spine and tail—three of the original nine survive—may have come from southern Asia. The fine workmanship in the detail of the scales, claws and tail adds to the flair of the object. The salamander is a real lizard but is also a mythical creature with the magical ability to survive and extinguish fire. For the officer who wore the pendant, it thus served as a talismanic protection against the danger of fighting on a wooden ship. The charm was even more necessary than its owner must have hoped when Girona set sail. The armada was held up by English manoeuvres and unfavourable winds in the English Channel, and left with little choice but to try to return to Spain. Its commander, Medina Sidonia, warned his captains to ‘take heed lest you fall upon the Island of Ireland for fear of the harm that may happen to you upon that coast’. The foul Atlantic weather took its toll: Girona was one of at least 26 ships that foundered off Ireland. On board was a crew of 600; Girona rescued 700 more from other armada vessels that foundered. Among those who drowned were the captain, Fabricio Spinola, and one of the fleet’s senior commanders, Alonso de Leiva. Most casualties were, as always, the anonymous foot soldiers of imperial wars. Just six are thought to have survived from La Girona. For those who did make it ashore, the land proved no safer than the sea. The English lord deputy, Fitzwilliam, gave instructions to ‘apprehend and execute all Spaniards’. In all about 5,000 Spaniards were drowned or killed, many by Irish lords who were fearful either of the Spaniards themselves or of the government. However, some of the nobles were captured and subsequently ransomed while others, notably Captain Francisco de Cuéllar, were given sanctuary by Irish lords until they could be spirited back to Spain. The wreckage of ships of the armada and the shore landings of Spaniards is called to memory by place names such as Carraig-na-Spania and Port na Spaniagh. Nevertheless, the failure of the armada, and the consequent consolidation of the Protestant monarchy of England, had enormous consequences for Ireland.